If you live anywhere in the United States you know that so far, 2012 has been hotter than hell. Between wildfires spreading across states and unusual heat waves barely escaping the winter/spring border, it’s been pretty bizarre around these parts. According to the annual State of the Climate report by the National Oceanographic and Atmospheric Administration, this has been the hottest January through June period in United States history. The national temperature of 52.9 degrees Fahrenheit was 4.5 degrees above average, with most of the country nearing record temperatures for large portions of the six month period. The average temperature for the contiguous United States during June was 71.2 degrees Fahrenheit, 2 degrees above the 20th century average. During the month of June, over 170 all-time warm temperatures were broken or tied. Currently, South Carolina and Georgia, which have hit 113 and 112 degrees, are under review as possible all-time statewide records. 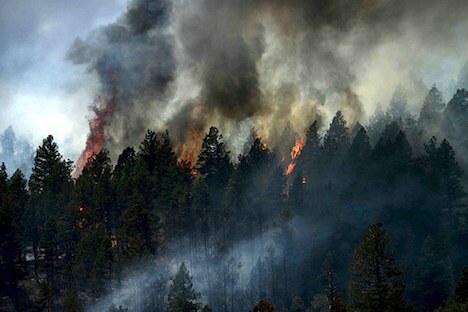 Wildfires ripped through 1.3 million acres across the nation, the second most on record during the month of June. These are just some of the devastating effects we’ve seen that have led more and more people to start realizing climate change is not just science fiction, it’s really happening. The sad part is that if we don’t make some serious changes soon, these kinds of extremes are expected to become the norm.